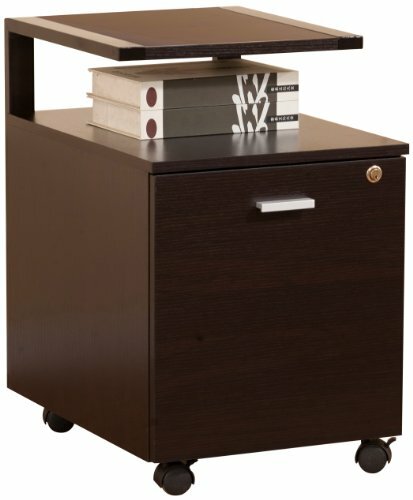 Outfit your home office with a smart, functional equipment trolley that radiates a classic modern appearance. Our equipment trolley/cabinet keeps your printer, CPU, scanner and paper close at hand and even provides additional workspace. Spacious file cabinet is low enough to tug away under an office desk. . File cabinet comes in two color options: Dark Espresso and Black. File cabinet is made of medium fiber board materials. To clean, use damp cotton cloth to wipe clean. Assembly required. Product Made in China. Once assembled, product measures 21-inch wide by 16-inch deep by 25-inch high; 30-days hassle-free replacement parts warranty. Pictures are for illustration purpose. All decor items are not included in this offer. Pictures are for illustration purpose. All decor items are not included in this offer unless mentioned.